In the first century B.C. the Roman Republic was torn by a series of civil wars that cost many lives and left Italy devastated. The last and the most important of these civil wars was between Mark Anthony (or Anthony) and his ally and lover Cleopatra and their rival Augustus. This civil war was known as Anthony's War in Roman times. The victor in this civil war was Augustus, for the sale of convenience he will be called Augustus even though technically he was still known as Octavian. After the defeat of Anthony at Actium Augustus was able to make himself ruler of the Roman world and to create the Imperial system, that was to continue in some form or other until the fall of Byzantium in 1453. The victory of Augustus changed the political system in the Roman Empire and it changed the relationship between the ruler and the ruled forever. His victory allowed Augustus, the first emperor, to dismantle the Roman Republic while keeping its outward forms. The victory of Caesar’s grand-nephew and principal heir allowed him to fully integrate Egypt and its territories into the Roman Empire. 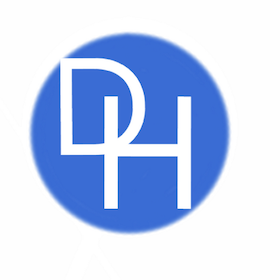 Perhaps most importantly, the defeat of Anthony and Cleopatra ushered in an era of peace and stability, which became known as the Pax Romana, that allowed many areas to enjoy an unprecedented period of peace and prosperity. After the assassination of Julius Caesar, it seemed likely that the Roman Republic would once more fall into anarchy. In the aftermath of the death of Caesar, Mark Anthony tried to seize power but was defeated by the two Roman consuls but they were both killed in battle. This allowed Anthony to regroup his forces and he entered into an agreement with other Caesarians, to form the Second Triumvirate. This arrangement included Augustus and Marcus Lepidus. The Triumvirate worked together to advance the interest of the Caesarians, such as securing land for veterans. The trio was also able to pacify the Empire and provided a measure of stable government. They defeated the Republicans at the battle of Phillippi and put down many other revolts, such as Sextus Pompeius in Sicily. Lepidus was marginalized and Augustus and Mark Anthony became the two most powerful men in Rome. They agreed to work together in the best interests of Rome. Augustus was given control of the west, including Rome, while Mark Anthony was given the east. The control of Rome was to prove crucial for Augustus in his later war with Mark Anthony. At this time Octavian’s sister married Anthony to secure the alliance between the two men. This alliance was to bring a measure of stability to Rome and its empire and both men reorganized the provinces and carried out much-needed reforms after years of conflict. Soon there were strains in the relationship between the two most powerful men in the Empire. This was because of Anthony’s brazen affair with Cleopatra, the Queen of Egypt and what was seen as the public humiliation of Augustus sister, who was Mark Anthony’s lawful wife. Anthony also increasingly acted like an independent ruler in the east and did not consult the Roman Senate or his supposed ally and partner Augustus. He also outraged public opinion in Rome when he gave his children by Cleopatra, territories that were officially part of the Roman Empire. August began a propaganda campaign against Anthony and this led to a bitter war of words between the two men. When Anthony married Cleopatra, Augustus used the humiliation of his sister to turn Rome against his former ally. Augustus claimed that Anthony sought to make himself and Cleopatra rulers of the east and break from Rome. The Senate in Rome was outraged by the actions of Anthony and concerned that he may even be prepared to make himself and the hated Cleopatra rulers of Rome. It was widely believed that Anthony was under the influence of Cleopatra. In the words of Plutarch ‘he was not master of his own faculties, but, as if he were under the influence of certain drugs or of magic rites, was ever looking eagerly towards her.’ At the request of Augustus, they stripped Mark Anthony of all his powers and honors and gave Augustus orders to raise an army and navy. Anthony gather his own and Cleopatra’s forces and civil war was inevitable. Anthony was able to gather a large army of Romans and Egyptians, while Augustus was able to raise an army of 200,000 experienced Roman legionnaires. Anthony who was by nature an aggressive commander assembled a large fleet and made the first move. He established a base in the Balkans and had his navy enter the Adriatic Sea. Octavian also assembled a fleet that was assembled under the command of Agrippa. The fleet of Octavian was composed of many light vessels while Anthony’s fleet had many large galleys. The ships of Augustus were to prove more suitable for the waters of the Adriatic. Anthony’s plans were betrayed to Augustus and this gave his enemy a great advantage. 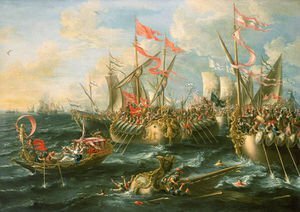 When the Battle of Actium began it soon became clear that the fleet of Anthony was in trouble and seeing this Cleopatra ordered her fleet to disengage from the battle. Soon Augustus fleet, led by the capable Agrippa destroyed Mark Anthony’s fleet. The Romans in Anthony’s service seeing the destruction of their fleet surrendered in mass to Augustus, while the Egyptians began to follow their queen and retired before even the approach of the enemy. Anthony was soon forced to flee and the outcome of the Battle of Actium was a great victory for Augustus. Anthony at first, he went to North Africa, here he had some legions but by the time he arrived they had defected to Augustus. In desperation, Mark Anthony fled to Egypt but Cleopatra refused to help him and he died by his own hand in accordance with Roman custom. The Queen of Egypt then tried to negotiate with Augustus but he ignored her pleas and she too killed herself. Augustus later killed her alleged son by Caesar and he took steps to ensure that Egypt was to be part of the Roman Empire. The civil war between Anthony and Augustus was not particularly bloody compared to previous wars such as that between Marius and Sulla. It ended much quicker than anyone could have hoped. The victory at Actium meant that Augustus had no enemies at least within his own borders. For the first time in a century, the armies of Rome were now under a single authority. For many years, the Roman legions were often the private armies of generals and not under the control of the Senate. Now Augustus was in control of all the armies and they were personally loyal to him. This was to transform the situation in the Empire. No longer was any general or party able to challenge the military supremacy of Augustus and this meant that few if any dared to question his authority. Because of the strength of Augustus, no one was able to rebel against him and hope to succeed. This meant that there were no more civil wars during the long reign of Augustus. When he died the first Emperor was able to pass on his armies to his heir and this ensured stability and this prevented any conflicts over the succession from developing . The later emperors followed Augustus example and ensured that they alone controlled the army and this led to an unprecedented period of peace in most of Europe and parts of the Middle East and North Africa. After his victory in the war against Anthony, Augustus was the most powerful man in the Roman world. He had control of the legions, a vast treasury and was very popular with the Roman population. Augustus had defeated the unpopular Anthony and Cleopatra and he was widely praised for bringing peace once more to Rome. Even his former enemies of the first emperor acknowledged his role in restoring Rome. This is seen in the poetry of Horace, who extolled Augustus, and his achievements even though he had fought against him at Philippi. Augustus had also maintained the unity of the Roman Empire. Anthony and Cleopatra if they had won may have decided to establish a separate realm in the eastern portion of the Empire. It was widely believed at the time and since that, if Anthony had won that he and Cleopatra would have created a Romano-Egyptian monarchy in the eastern Mediterranean. For this many saw him as the ‘restorer’ of the Roman Empire. Augustus was, in reality, the most powerful Roman but under the law and under the political system he was in theory just another citizen. Augustus was aware that the Roman Republic was no longer a viable entity and that if he did not maintain the peace that there would be another civil war and that eventually, this would ensure the destruction of Rome and its empire . He believed according to Plutarch that too much freedom under the Republic had led to the civil wars. Augustus was determined to create a political system that he could control that prevented another civil war . However, he now that even with his great power that the Romans would not accept him as a monarch as they were deeply attached to the Republican traditions and values. 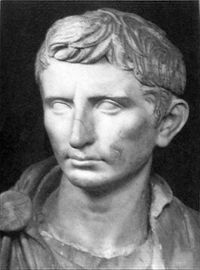 Augustus the devised a clever strategy he outwardly observed the forms of a Republican government, while at the same time gaining more and more control of the system. Tacitus and other Romans believed that Augustus approach ended the Roman Republic but replaced it with something superior, namely the Imperial system. He continued this policy for many years and he slowly established the imperial system. The victory over Anthony provided Augustus with the resources and means to begin the transformation of the Roman Republic into the Roman Empire. One of the most important outcomes of the civil war between Anthony and Augustus was the absorption of Egypt into the Roman Empire. Egypt’s, Ptolemaic rulers had long been dependent on the Romans and had become under the increasing control of Rome. Augustus was to formally annex Egypt and he ended the rule of the Ptolemaic dynasty which had successfully governed the kingdom for almost three centuries. Augustus turned Egypt into a Roman province and ensured that the wealth of the province would benefit Rome. He established a system whereby Egyptian corn was used to feed the teeming metropolis of Rome, under the system of the Annona. This was to help stabilize the situation in Rome and did much to ensure the Pax Romana. The first emperor was aware of the critical importance of Egypt to the Roman Empire and he decreed that a knight and not a senator should be governor of the province. He was afraid that if a senator had control of the province that he could use its wealth to rebel. Augustus system was to ensure that Egypt was to remain at peace and a crucial part of the Roman Empire. 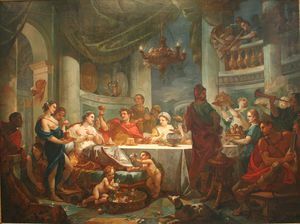 Augustus victory at Actium and his defeat of Anthony and his lover/ally Cleopatra was momentous. It had several significant consequences. Firstly, it ended the period of civil wars that had plagued Rome and its Empire for a century. This led to a period of remarkable peace and stability. The Pax Romana after the battle of Actium allowed Rome and its provinces to experience a period of economic growth and a cultural flourishing. The victory of Augustus allowed him to become the undisputed master of Rome. He cleverly created a system whereby he became absolute ruler while maintaining the forms of Republican government. In doing so he established the Imperial system and he was effectively the first Roman Emperor. Augustus in the wake of Actium was able to gain full control of Egypt and it was to become an important part of the Roman Empire and later the Byzantine Empire, until the Arab Conquests in the Eight Century.